Since March 2016, we have been featuring one national park per month leading up August, which is the National Park Service’s 100th birthday. This post series (links below) have given you a glimpse of our National Park journeys ranging from rugged mountains to lava-filled volcanoes. It seems only fitting that with the final post of this series, for the 100th birthday happening later this week, we look at our adventure down into the depths of the grandest canyon of them all – The Grand Canyon! There is something so magical about the Grand Canyon. It is beautiful and filled with so many colors and layers of history and work from the natural world. The Grand Canyon also teaches us such an important lesson – that nothing happens over night. 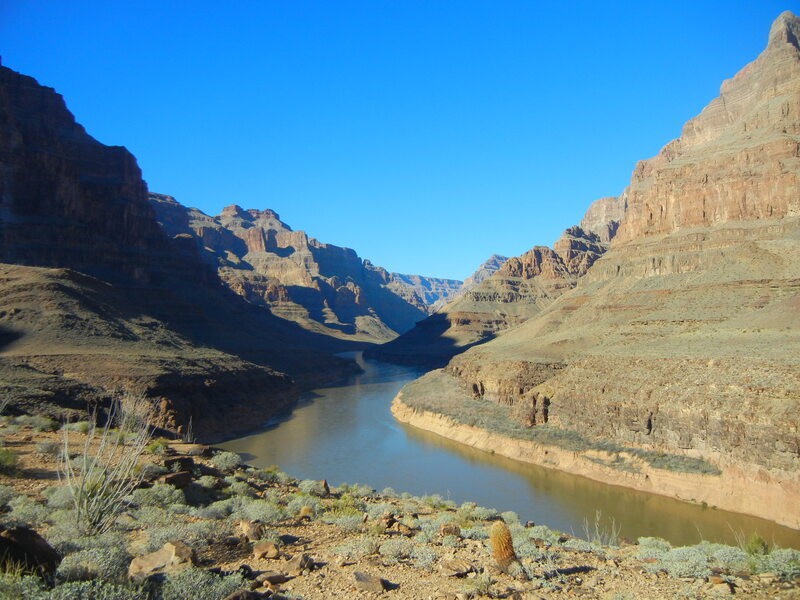 I can remember visiting the Grand Canyon as a child on family road trips. It was so big and scary and beautiful, all at the same time. I still feel that way about it and have always loved the distant glimpse you get of the canyon when you’re lucky enough to be flying on a route that passes nearby. On a recent trip to Vegas, we decided it would be great to visit the area since neither of us had been there since we were little. Because of its close proximity, it is easy to make a day trip out of it, and there’s plenty of options available for making this adventure happen. Since I’ve always loved getting those glimpses of the canyon from the window of a plane, we decided to take that one step further and head to the Grand by helicopter! Tours from Vegas take about 45 minutes of flight time and offer an amazing vantage point of Hoover Dam and Lake Mead on the way, as well as the sky walk. As you approach the Grand Canyon, you notice the landscape changing and can sense the spectacular scenery as you fly nearer to the rim. This trip allowed us not only to fly over the west rim of the Grand, but to actually fly into it and land at the bottom nearly a mile down. Although our time in the bottom of the canyon was limited, it was nonetheless enjoyable – we were treated to the perfect picnic lunch and greeted by the cutest little chipmunk. So many times, we spend our lives looking down, especially when we happen to be top. But what a change of outlook it is to look up from the bottom. It’s physically and mentally uplifting, and even more inspirational than one would imagine. I can think of no better place to look up, inhale, and get lost in the moment. Remember…. Life is as GRAND as you make it!! To read about the first park we featured, Yellowstone National Park, click here. To read about the second park we featured, Rocky Mountain National Park, click here. To read about the third park we featured, Grand Teton National Park, click here. To read about the fourth park we featured, Hawaii Volcanoes National Park, click here. I hope you have enjoyed our post series on America’s National Parks. If so, we’d love your comments on your favorite posts, parks, or anything we’ve inspired you to go visit!! Happy 100 years to our National Parks! We are looking forward to making it to more National Parks in 2017 – I have my eye on those in southern Utah! Thank you! It is a great place and there’s so many different ways to get there and areas to go to! Enjoy! I love the Grand Canyon, I went a few years ago and was blown away. I thought it was going to be overrated, but its not! How much is it for the helicopter ride from Vegas? I’m so glad you enjoyed your time there! There’s a bunch of different prices depending on the package and company you book with. You will really enjoy your time there! I want to go back and visit Horseshoe Bend! Love love love your photos, they’re stunning!! I really hope I manage to get to the Grand Canyon one day! It is such an impressive place! It is amazing what the natural environment is capable of! Angie, I actually thought of you guys as I typed this blog post up… I know the Grand Canyon Sky Walk is on your bucket list!!! I love our National Parks…they all have their own uniqueness, especially the Grand Canyon. Your photos are fabulous, always fun to do the flight above to get a better view! Thank you! I can’t wait to get out and explore more National Parks! Do you have any favorites? The Grand Canyon is one place on earth that justifies the word AWESOME. It really is. I saw it on a day trip from Vegas, which was no where near enough time, so we’re hoping one day to go back, stay and explore it further. It must have been absolutely amazing to be right inside at the bottom looking up. Thanks for the idea, definitely worth saving up for! It is definitely a place you could spend so much time exploring! You will have a great time when you get to the Grand!! I’ve never been in a helicopter before and I can definitely think of worse places to do so than the Grand Canyon! Was it at all nerve wracking actually flying into the canyon, with the walls either side of you? It was incredibly smooth! What was a little nerve-wracking (but mostly super fun) was the flight back… the pilot decided to show off his skills and did a couple of fast climbs and nose dives heading straight down toward Lake Mead! Talk about hitting some negative g’s!!! Jenn, incredible trip and truly a once-in-a-lifetime experience to see it from a helicopter AND go to the bottom. I was lucky enough to visit last year and do a couple of hikes but you got to see it from such an incredible angle! Thanks for sharing!